Food unites us. When we think about meeting someone, we do it over food. We talk about bonding experiences such as, "She made a roast like my mom did". A wedding includes the experience of food. If we christen children, we usually have a celebratory meal afterwards. Graduations include an open house with food. Holidays are ripe with food. And, when we move on to another existence, our survivors come together afterward for a comforting meal, to remember and reflect. "This was his favorite food". As I look back over the holidays, it struck me that the fun times, the calm times, the times that centered my existence revolved around food. It started with a Saturday brunch with Pam. She found a Baker's Square reasonably close to us and that's where we went. There used to be one near the high school and, our bonding time, our getting to know each other time, was spent after football games or band practice, sitting in the booths or at the back table, laughing and talking. When that Baker's Square closed, there just wasn't one close by. We've missed it, well, the pie, mainly. We maintain our friendship over Steak 'n Shake and IHOP, but finding a Baker's Square reasonably close brings back a different time. 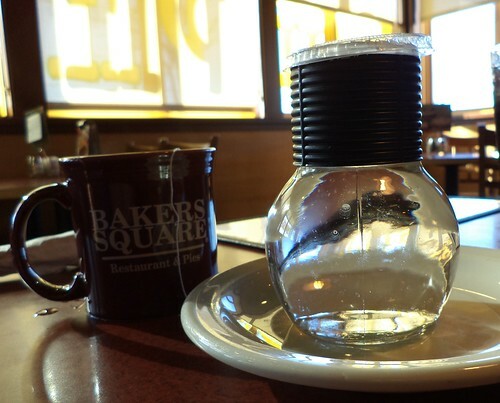 There are so many wonderful memories contained in that glass decanter of hot water. Other than putting their names on their mugs, the method in which they serve tea has not changed in oh so many long years. I always liked this kind of decanter. It really doesn't spill and the wait staff knows when I'm out of hot water. For Christmas, one of my guild members sent me a Subway card. It was completely unexpected and I was floored. Well, Subway is kind of the perfect thing to get me, truth be told. It's the right size. It's the right color. It won't be out of style in 6 months. It doesn't cost an arm and a leg to ship. There are 2 Subways near me, but I'm known by face at the one closest to the office. Thanks to the card Carole sent for my birthday and the one Don sent at Christmas, I now have the staff trained. When I walk in, the only questions they ask me is, "What kind of bread? Do you want it toasted?" I'm kind of predictable. 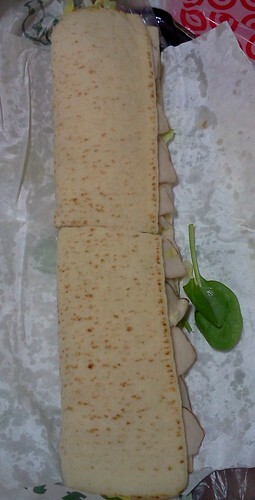 Subway is comfort food as well as being a bit better for me than gorging on hamburgers and fries. With these crappy days of cold and then rain, sleet and snow mixed, I came home exhausted and the last thing I wanted to do was cook. That makes me eat handfuls of cereal at 10 p.m. because I am hungry. This isn't good nutrition. Having a Subway card to use to get a good sandwich was a godsend. For several days, I ate well. Mija and Pilchard like the turkey so I do have to share but with lettuce, spinach and green peppers, I'm getting some servings of vegetables. On that one night when driving was an exercise in patience, having this in the front seat for supper made the stress melt away. I had to go out the next day, but, for the moment, I was calm. And Patt sent me another Starbucks card. 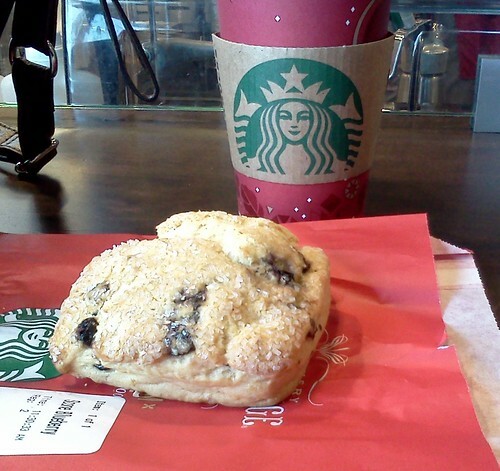 Starbucks isn't a place I frequent because I'm not a coffee drinker. During the winter, however, there is nothing like hot cocoa or their hot apple cider drink to take the chill out of the air. As I've been out in the field, including one Saturday of work, having a Starbucks card made the day go by easier. That's a blueberry scone. It's not triangular as the ones at Panera are, but they warmed it for me. I sat in Starbucks and sipped my cider, munched my scone and thought of the friends who made this and my other treats possible. Dietitians may bemoan the amount of friendship eating that one does because it can be filled with not so great choices, but I think the friends who care to go find a long lost restaurant or provide you with gift cards to favorite places are worth keeping. I'm ever so grateful for their thoughtfulness and when that gift card comes out of the wallet, I smile. Friendship food is the best food.